 We offer our services in Broadcast Video & Audio Professional Equipment, Camera Cranes, Microwaves and SNG system, Systems Integration, Broadcast Rental and Turnkey Project Solutions. DS-150S(150Wh) is the new product Dynacare launched recently features at larger capacity, lighter weight and more compact design. With similar dimension as the regular 89Wh battery, but rated at 150Wh capacity, it means much longer shooting time. Built-in 5 LED power indicator shows accurately the remaining capacity. It can power the camera and other accessory with the built-in Power Tap simultaneously. Lithium Ion Battery Protection Technology inside is designed to prevent over charge, over discharge, over current, short circuit, etc. DS-220S (220Wh) is the new product Dynacare launched recently features at larger capacity, lighter weight and more compact design, with similar dimension as the regular 160Wh battery Rated at especially large capacity of 220Wh, it means that it can support much longer shooting time. Built-in 5 LED power indicator shows accurately the remaining capacity. It can power the camera and other accessory with the built-in Power Tap simultaneously. Lithium Ion Battery Protection Technology inside is designed to prevent over charge, over discharge, over current, short circuit, etc. DS-150A (150Wh) is the new product Dynacare launched recently features at larger capacity, lighter weight and more compact design. With similar dimension as the regular 89Wh battery, but rated at 150Wh capacity, it means much longer shooting time. Built-in 5 LED power indicator shows accurately the remaining capacity. It can power the camera and other accessory with the built-in Power Tap simultaneously. Lithium Ion Battery Protection Technology inside is designed to prevent over charge, over discharge, over current, short circuit, etc. Dynacore DS-U65 is compatible with PMW-EX1/3 camcorder. Rated at 4400mAh(65Wh), DS-U65's capacity is higher than Sony original BP-U60 battery(56Wh), which means longer shooting time. The DS-U65(65 Wh) Lithium-ion Battery effectively supports professional video shooting in both the field and the studio. The battery is are equipped with the professional INFO function that intelligently communicates battery status data to the PMW-EX1/3 camcorder. Dynacore DS-U65 can power up camera and accessory such as camera light simultaneously. Small and lightweight the NP-F970/B battery has built-in microprocessors that accurately calculate the remaining power within minutes. The microprocessors continuously communicate with the camcorder to ensure that remaining battery life is displayed on the camcorder LCD as well as in the viewfinder so you'll never miss a shot. The NP-F970/B doesn't have the memory effect found in other batteries, so you can charge it at any time, regardless of how much charge is remaining, and the battery will never lose its ability to hold a charge. The Sony HVL-20DW2 Video light is switchable between 10W and 20W. Designed to mount onto the camcorder's accessory shoe, the HVL-20DW2 provides 10W operation when used with an NPF-550 InfoLithium battery, and 20W operation when used with NP-F970 InfoLithium batteries (batteries must be purchased separately). The HVL-LBPA is a fully adjustable LED light capable of high intensity spot-lighting (600lx@1m) or uniform flood-lighting (300lx@1m) making it ideal for interviews or wide-angle shots. 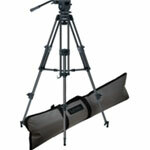 An attached diffuser makes it possible to soften shadows and reduce contrast as required. The HVL-LBPA is powered by existing NP-F series batteries and due to its low power consumption of 16w it can be operated for approximately 3 hours* making it a cost-effective lighting solution. The Sony AC-VQ1050D AC/DC Adapter and Battery Charger charges two InfoLITHIUM L Series batteries back-to-back. Up to 70% faster than your camcorder's original battery charger, one battery will quickly power up, followed by the other. In addition, the LCD displays time remaining for a full charge as well as battery life remaining. The AC-VQ1050D can also be used to power your FX7, FX100, or other compatible camcorder as well as the Sony GVH-D700 HDV Portable Video Recorder. Connect the appropriate adapter to your car's DC cigarette lighter or your AC wall outlet for continuous recording. *Intelligent "INFO" battery that communicates digitally with Sony camcorders Remaining capacity indication on viewfinder of the DVW-970/970P, HDW-750/750P, HDW-730/730S, MSW-970/970P, PDW-510/510P, PDW-530/530P camcorders V-mount attaching mechanism for quick and easy battery change Four-step green LED indicators for quick visual verification of the battery remaining capacity (more than 80%, 60%, 40%, 20%) Four-step orange LED indicators for quick visual check of battery remaining capacity (below 20%, 15%, 10%, 5%) When the BP-GL95 is used with camcorders other than those listed above, the battery alarm may not function properly. The Sony AC-DN10 is an AC power supply and V-Mount Lithium-Ion Battery Charger; it has the ability to mount directly to Sony Camcorders featuring V-Mount technology. The user can charge batteries while supplying power to other equipment. The BP-GL95 can be fully charged within 145 minutes. The DIONIC 90 can handle a 6 amp load and is the ideal battery choice when low weight and longer run-times are a priority. Delivering 10 Amps, DIONIC 160's configuration is constructed of specialized Li-Ion cells originally designed for high rate military operations. Weighing 30% less than a NiCad or NiMH battery, it has 15% more capacity and will run a 30 Watt camera for over 5 hours. This high power NiMH battery system is ideally suited to the power demands of today's high definition equipment and on camera lighting systems. In lower power applications, it can provide power for many hours without limits or travel restrictions. The HyTRON 100/140 also offer an excellent counterbalance to offset the weight of a lens. With the recent transition to HD cameras, the HyTRON 140 typically provides up to 4 hours of run-time with a single battery. A new cell technology has been employed to provide key improvements in battery life, durability, and discharge performance in all environments. Anton/Bauer‘s InterActive© Chargers are designed to charge many different battery chemistries using efficient charge control circuitry coupled with a detailed communication system. The InterActive® charging system allows batteries to identify themselves to the charger, thus allowing the charger to select a charge routine specifically designed for the cell chemistry characteristics of the battery. Seven full-time charge termination algorithms (TCO, -V, temperature compensated VCO, DT/dt, CCO, FUL, and I-min ) give the InterActive® System® the ability to maintain the superior reliability, performance, safety and service life of Anton/Bauer batteries. The PowerCharger® series is equiped with an LCD readout capable of displaying battery information including, but not limited to, date of manufacture, serial number, cycle count, temperature, and capacity. The diagnostic discharger (DDM) feature also allows the PowerCharger® to test a battery for routine maintenance purposes. 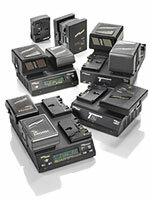 From the economical T-Series charger, to the full featured PowerCharger®, Anton/Bauer InterActive® chargers give the video professional, broadcast professional and digital cinematographer, an unprecedented charging and communication system that has redefined the standard by which all other battery charger system are measured. Incorporating all the features of the Logic Series batteries, The CINE VCLX Series provides superior runtime and service life for the power demands of today's cinema production and lighting equipment. All safety and high power draw performance of Nickel Metal Hydride cell chemistry technology is available in a power package specifically designed for the integration of 24v film and 14VDC video equipment. CINE batteries are powerful enough to run for extended periods of time with many cameras mostly used in the world of film and digital cinematography, including the ARRI 235, 416, 435, 535, D-21, ARRICAM ST/LT, Moviecam, the new ALEXA series of cameras, RED One and EPIC, Sony F23/F35, Sony F900 series and SRW-9000, Phantom HD, Panavision Genesis, and Panasonic Varicams. The high power 28VDC/12A output is also capable of powering 250w HMI lights, lighting panels and portable microwave units. All Anton/Bauer CINE batteries feature a RealTime® LCD that accurately displays remaining runtime and a visual LED warning indicator when 15 minutes of run-time remain. The Stasis Flex builds on the innovation of the original Stasis Support System. Redirecting the geometry of the handheld camera, the Stasis Flex makes use of the most stable platform in the world: the human body. This revolutionary, infinitely adjustable system stabilizes shooting and relieves fatigue by redistributing camera weight on the torso and shoulder. Winner of the 2008 Good Design award. 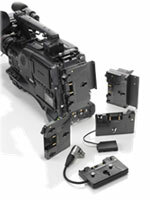 The Anton/Bauer Gold Mount system is the most widely used battery mounting system in the industry. For 40 years, this snap-on system has allowed the use of a single system of interchangeable batteries for virtually any camera or accessory including field editors, monitors, test equipment and more. To complete the Gold Mount System, the future upgradable InterActive Battery Charging System allows us to continually introduce the latest battery technologies. Many camera manufacturers, such as Panasonic, JVC, Ikegami, Hitachi, Grass Valley, and most recent ARRI cameras come with an Anton/Bauer Gold Mount bracket as standard factory installed equipment. This versatile mounting system, along with the advanced features of Anton/Bauer Logic Series Batteries and InterActive Charging Systems makes the Gold Mount system the format of choice for video/film professionals and manufacturers. The Libec RS-250 75mm 2-Stage Aluminum Tripod System is a lightweight, cost-effective support system designed to take advantage of the growing proliferation of small HD cameras being used in an ever-widening range of applications. It starts with the RH25, a professional tripod head that, due to its variable counterbalance system, can accommodate a wide variety of small HD cameras--from handheld to semi-shoulder-mount--and still maintain perfect balance. Combined with a 2-step drag mode and an ability to function in temperatures as low as -40°F (-40°C), the RH25 provides smooth, dependable panning and tilting. The Libec Professional 2-Stage Aluminum Tripod System w/Ground-Level Spreader rises to the challenge of today's proliferation of smaller, more sophisticated HD cameras. Combining high performance with affordability, the RS system improves on past tripod designs by offering a new drag system that allows for smoother pans and tilts, especially at the start and stop of each move. Image wobble is further reduced by a new tripod design that's less prone to twisting, while a superb counterbalance system keeps your camera perfectly balanced at any angle. The RS-350 system brings together an ideal combo of elements: the RH35 head, with its 3-step drag, 20 lb (9kg) load capacity, and 90°/-70° tilt angles; the 2-stage RT30B aluminum tripod, with its 75mm ball mount and 59.5" (150cm) maximum height (65.5" with head); an SP-2B floor spreader, which holds the legs in place on flat surfaces; PH-4B pan handle; and an RC-30 carrying case to keep all the pieces secure and ready for travel. As part of the RS series, Libec's RS-450 Professional 2-Stage Aluminum Tripod System with Ground Spreader introduces its "free plus 3 steps" drag system along with a counterbalance range of 4.5 to 10.5kg (maximum payload of 12kg). This makes for a smooth, wobble-free image whether panning, tilting, or stopping movement on a dime. A low temperature rating of -40° C/F plus LED bubble illumination lets you continue shooting into the cold of night. Complete counterbalance makes it possible to stop the camera precisely at any tilt angle within the range of 4 to 10kg weight on board (height of center of gravity at 100mm). The new drag system makes a quantum leap in operability when panning or tilting. There is also a significant reduction in wobbling of the image that occurs at the start of the pan as well as backlash at the end of the pan. Designed for use with today's smaller DV and HD camcorders, Libec's TH-650DV is a compact, all-in-one tripod system. 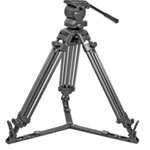 Incorporating head, legs, and a mid-level support brace, the TH-650DV is the perfect entry-level tripod, combining affordability with smooth operation and compact design. The TH-950DV 2-Stage Aluminum Tripod System, though weighing only 8.1 lbs (3.7kg), provides ample support for today's lighter digital camcorders. It comes with the H22DV head, providing smooth pans and tilts with no backlash or bumps, and rapid, secure camera counterbalance, with a -60° to +90° tilt angle. 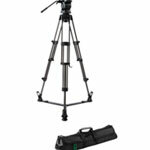 Also included is an aluminum 2-stage tripod with center brace, offering superb strength and stability, with precisely spaced fastening to prevent tripod pinching when closing the system. 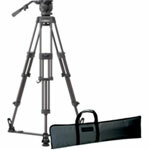 The LS-22DV 2-Stage Aluminum Tripod System, though weighing only 8.5 lbs (3.9kg), provides ample support for today's lighter digital camcorders. It comes with the H22DV head, providing smooth pans and tilts with no backlash or bumps, and rapid, secure camera counterbalance, with a -60° to +90° tilt angle. 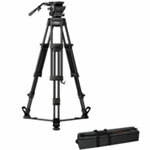 Also included is the T68 aluminum 2-stage tripod, offering superb strength and stability, with precisely spaced fastening to prevent tripod pinching when closing the system. For demanding ENG applications, the Libec LS-38(2A) Professional 2-Stage Tripod System is a complete support package for serious Mini-DV and HD videographers on a budget. The H38 fluid head offers fixed counterbalance, silky-smooth fluid drag, and a convenient, industry-standard 75mm leveling ball. Firmly footed on its SP-1 floor spreader, the 2-stage, three-section T72 tripod features reliable aluminum leg tubes and double truss construction for superior torsional rigidity. Finally, for easy transport, the TC-70 soft carrying case comfortably contains and protects the whole kit to endure the daily rigors of field production. With features normally found only in higher-end supports, small ENG production crews using HD camcorders and DSLRs will appreciate the budget priced Libec LS-55(2A)M Professional 2-Stage Aluminum Tripod System. The H55's two-step fluid drag and fixed spring counterbalance delivers the slippery-smooth feeling of a high-end head without sacrificing ease of setup. Attach the head and level quickly with the industry-standard 75mm claw ball, select the appropriate drag mode for the camera in use, and start shooting. For fine tuning, the camera plate has 40mm of travel to accommodate varying lens weights. Standing firmly in any setting, the two-stage T72 aluminum alloy tripod features twin tubes in the top two sections for superior torsional rigidity. Cine-style rotary locks clamp each stage regardless of ambient temperature, offering real peace of mind in conjunction with the SP-2 floor spreader. The LS-55(2A)N delivers everything you'd want and more in a lightweight package that's easily transported in the included TC-70 soft case and comes with a 3-year warranty.With features normally found only in higher-end supports, small ENG production crews using HD camcorders and DSLRs will appreciate the budget priced Libec LS-55(2A)M Professional 2-Stage Aluminum Tripod System. 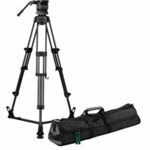 Small ENG production crews using Mini-DV and DVCAM camcorders will appreciate the moderately priced, yet full featured, Libec LS-60M(2A) Professional 2-Stage Aluminum Tripod System. Crowning this solid support system, the H60 fluid head offers two-step fluid drag, fixed counterbalance and a sliding camera plate with 40mm of travel to accommodate varying camera/lens configurations. 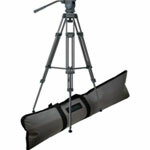 One PH-7 telescoping pan arm is included, but a second rosette is present for two-handed or left-handed setups. 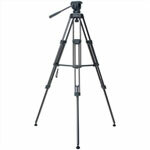 Standing firmly on its dual-tubed legs, the two-stage T98 aluminum alloy tripod features superior torsional rigidity throughout its 22.0-62.0" (55.8-157.5 cm) height range. With the BR-3S mid-level spreader still attached, it all folds down to a compact 32" (81.3cm) for transport. At the end of the shoot, the entire LS-60M(2A) system fits comfortably within the included SC-9 soft case for safe travel. March with confidence knowing that all components carry the solid Libec 3-year warranty, backed up with friendly, accessible technical support. 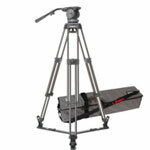 The foundation of the LS-100(2A) is the robust T103 2-stage aluminum alloy tripod with dual-tube construction. Rotary clamps firmly lock each section in place regardless of temperature fluctuations. The hard rubber feet which terminate each leg stand firmly alone, or locked into the included SP-5 ground-level spreader. For transport, a convenient mechanism quickly hooks all three legs together when collapsed. Standing tall on the 100mm leveling bowl, the H100 fluid head includes one PH-7 pan arm, but has a second rosette for dual or left-handed configurations. For varying lens and camera combinations, the continuously variable counterbalance and sliding camera plate provide finger-tip handling up to the load limit of 55 lbs (25kg). Whip pans, slow motion sequences--no problem. Continuously variable true fluid drag provides precisely the right amount of dampening you need. Finally, if you dread mounting a fluid head in the dark amid a web of cables and under sheets of driving rain, you'll find inner peace with the illuminated bubble level shining brightly with a ruby glow in your sea of chaos. As a working professional in the field, you demand strength, versatility, and reliability from your field kit. With the Libec LS-100(2A), you'll find that and more from spreader to wedge plate, backed with the iron-clad Libec 3-year warranty.